I was a bit tired but this was quite a fun night. The Baby Woodrose Dropout LP reception was over at the local record store a few blocks away, called Route 66, from 5 until 9 in the evening. A lot of cool people there that I knew and met. I went home and ate some food and watched a bit of the Osbournes (A very disturbed and fucked up family!) and came to Stengade and hung out with the Ghost Rocket guys. We talked about a lot of stuff and heard some really cool demos of Nikolai’s (keyboard) demos, which were really like dark trippy 60’s stuff. Great! Not many people but about 35 or so. All the guys who have ever played in On Trial (1986-2002) except for Bo (Singer) were at this show, which was pretty cool. 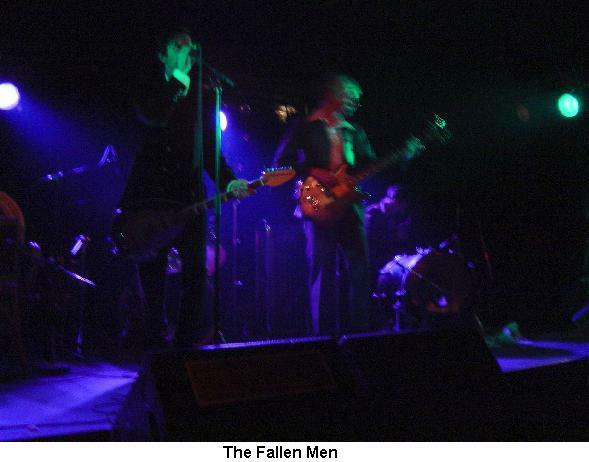 Show started about 11 with The Fallen Men. Two guys and a girl (guitar, bass and striped down drum kit). The show began with a strange, almost spoken like Velvet Underground thingy. This group played some really strange tortured freak rock. Pretty low fi and basic but a lot of human in it! There were not many people watching but I enjoyed most of their set. 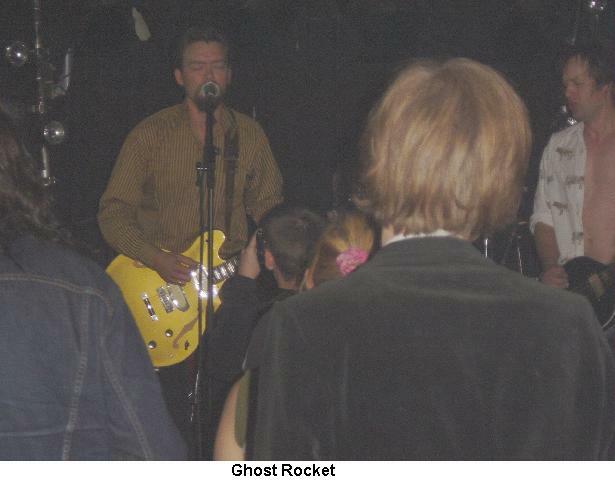 Ghost Rocket got going within 15 minutes and then the people from the bar came down. Great to see Guf and Anders from Baby Woodrose up in the front and Henrik (doing lights), Nik, and Birgir from On Trial there as well. Lars (Bad Afro), Jens (Lowcut), and others I knew were there as well. Anyway, they started with "Ghost Rocket", a really fast upbeat garage rocker. The sound was really loud and sharp and the drums like a heavy metal train, rather than garagy sounding. Anyway, the band was hot and sounded great. The set was a mix of originals and very obscure cover songs. "Daredevil" followed by the bands great "Drug Freedom" sing along anthem! Some more really serious garage punk fuzz rock before the band brings it down a bit. "I think I Love You" had a far out psych ending that lasted a couple of minutes! "Punkrocker", an obscure cover from '76 was pretty cool. "1 Million Times" is a great song. One of the bands best for sure. The band had created a good mood by now and Morten had played some cool guitar solos. Nick (bass) was all over the place and having a great time. Klaus is a monster drummer, really pounding the kit! Nikolai really knows how to play this 60’s style keyboard pieces but was mixed poorly tonight. The set closed with the monster heavy "Straight to Hell", with incredible drums and a small jam. The band were called back for some more and we got "I’m Goin’ Home", an obscure Sonics song that Baby Woodrose has recently covered as well (Morten and Guf used to play together and have the same musical roots and independently covered this song not knowing each other were doing it, probably because they would have liked to have played this years ago with On Trial! Just a theory!) Anyway, the big surprise for me was they played "Pandora", a quite fast and heavier version than Baby Woodrose. An excellent performance and the band quite liked it as well!